Spot98 sells all types of Iron-on Letters, Iron-on Numbers and fashion forward Decorative fabric Lettering and Decal Designs. 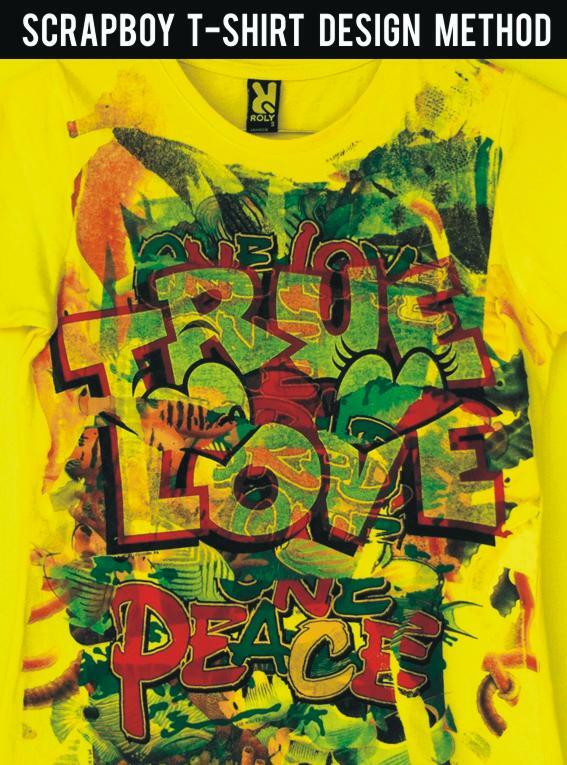 The Custom Printing Shop offers project focus options to reproduce the client's Designs as Custom Iron-on Transfers, ready to wear Custom T-Shirts and other Blank Clothing Apparel. Yours alone, Do It Yourself, create your own stuff. Spot98 team is all about making your project a success. On Yonge street near Dundas by the Piccadilly Tube where local bands played, there was a guy who became obsessed with making custom t-shirts, so he opened a store and everyone came to print their favorite Band Decals, names and Word Slogans with iron on letters on shirts. All walk out of the store with a big smile showing off their feelings front and center on the shirt. He was pushed to expand the business by Rudy Gunther, the inventor of the trucker wallet, yes the world famous wallet that attaches to your pants with a chain. It was the beginning of a Multi-Store retail chain and Factory, known as Royal Leather. His retailing mentors Sam and Sid Sniderman, aka " Sam The Record Man ", who exposed him to the retail trade and the showbiz industry. Sam Sniderman, who gave him a job at the Record Store in the early days and a life long friend. Sid Sniderman who taught him the humble factor in great success. In 1990's, he received a Nomination from the Bank Of Montreal for New Business Entrepreneur of the Year, he contributed to Eastman Kodak Imaging division in the development of Digital iron-on Laser Transfers, aka Photo Transfers that have bloomed into a new industry of it's own. During this time, he met Carl and Ann Beam, Carl called him "Freeman", they would spend time together around the Kodak Laser Copy machine. Anne Beam gave him Rescue remedy a few years after I was born. Carl and Anne would walk in with cut out newspaper stuff, books, feathers and other stuff to be photocopied on to Photo Transfer Paper media. Sort of spanking fresh new this transfer paper then. They would randomly photocopy these images one at a time doing things to it like passing the a color graphic or photo through the machine using single color like CYAN, or allow some light to bleed in effect as it passed the scanner, etc. Anyway, Carl Beam would walk out of his place with hundreds of these Photo Transfers. Some of these art pieces can be seen at the Art Gallery of Ontario (AGO) and at the National Gallery of Canada, created by Carl Beam using Paper Transfer Media, and other materials. These two great people expanded his mind beyond art. "I'm aware of the fact I would never become a millionaire selling t-shirts. I do it because I like it." To give you an idea of what this guy is all about, before he started making his own iron on transfer designs, he contacted all the major manufacturers of iron-on's after he attended a Trade Show of the Imprintables Industry and gathered a bunch of calling cards, he contacted these transfer companies at the time and asked them if he could have (free of charge) all the Defective Transfers they made that would end up in the garbage because they could not be sold. Not all agreed but some transfer companies did agree to ship him these Garbage Bound Iron on's . This is when he started playing around with these damaged graphic heat transfer in the basement of his College Street T-Shirt Shop in Little Italy, Toronto. Funny that store where he was now creating Recycled Art T-Shirts in the basement, out of candy wrappers, paper media, garbadge bound iron-on transfers from Clark down in the USA, Stahls and other stuff. Have a look below to see how these recycle t-shirts turned out. You can get a T-Shirt Party Pack and try out this t-shirt design method yourself. Fun stuff. This Little Italy store in Toronto Canada was in fact Sid Sniderman's ( sam the record man ) Original Retail Store location Sniderman’s Music Hall.
" Sniderman’s Music Hall, the origins of Sam the Record Man, earned its fame and fortune because its many listening booths allowed music to be sampled prior to purchase. Denise Cronenberg, the acclaimed costume designer and her brother David, the director, remember being sent to the Music Hall by Esther, their mother, to haul their father back home.
" Let's Get Personal "
The Toronto Star " Let's Get Personal " T-Shirts created in the Basement of the College Street store that led to the Toronto Star Fashion Editorial feature and interview with Scrap Boy. Even today you will notice the Spot98 Home page continues to use the slogan " Let's Get Personal ". The start of the recycled creativity wave with Collage Design Shirts and the birth of Scrap Boy T-Shirts. 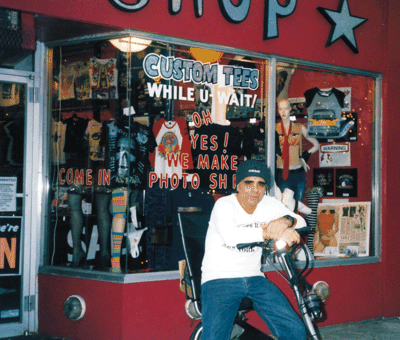 Chooses to live an OFF spot life, has made 100's of shirts for celebrities, shirts have been featured in News/Magazines and TV shows, 30 years later, he is still obsessed with iron on's, enjoys his job and continues to make people happy with a team of coworkers that love this custom t-shirts thingee too. Spot98 also offers a free service network for artists/designers to expose their work, promotes kids and teens involved with artistic school projects, contributes to the Parkdale Film and Gallery Community The Queen Retail Store is like a magnet for freestyle do it yourself creative outlet for all.